I have mentioned before how much I enjoy going to and indeed on occasion being part of a book festival. I told you a few weeks ago that I was going to be heading to Gladfest at Gladstone’s library when it is one over the first weekend in September, more info here, and now I have two more to tell you about as I will up and down the country like a yo-yo at the beginning of October and I am really excited about these trips already. They will be needed as I am sure to be having a bloody massive small comedown after I get back from America and ‘Readers Road Trip’ with Thomas and Booktopia Petoskey with him, Ann and Michael. The first festival that I will be heading to will be the Ilkley Literature Festival where , on Saturday the 3rd of October, I will be joining author and vlogger Jen Campbell and Unbound Publishing’s editor Rachael Kerr to discuss Writing and Reading in a Digital Age; Books and Reading from the Romans to the Digital Age. This event will happen in Ilkley Playhouse and be chaired by the very lovely Claire Newman, who is the Chief Executive of New Writing North and has kept me in line when she chaired an event I did in Newcastle. I am really looking forward to this as these three ladies are all ace, all very forward and I think the conversation and debate will be rather interesting, if I do say so myself. 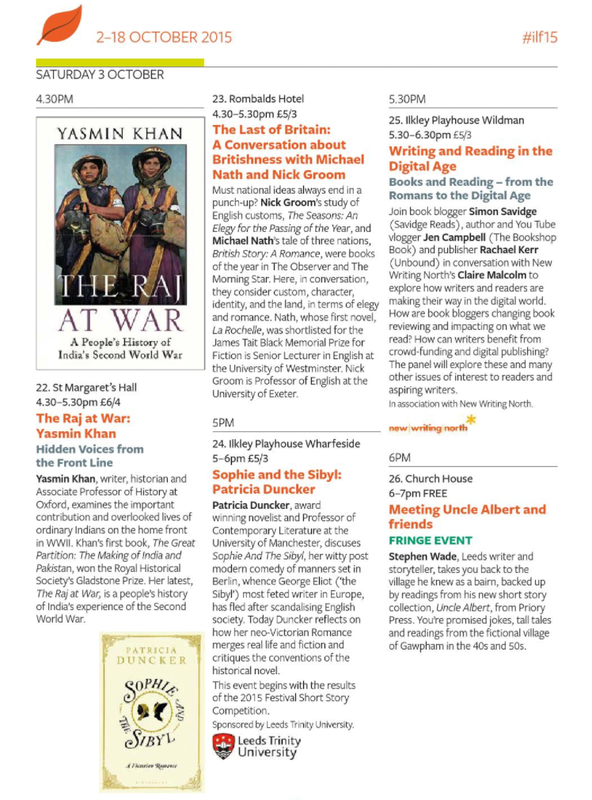 I am also going to try and sneak into some of the other events on around it, you can find the programme PDF here – it would be lovely to see some of you there. 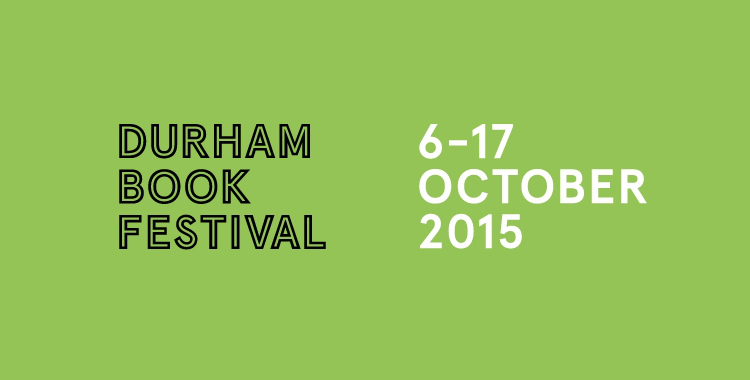 Next up, announced just yesterday, is the lovely exciting news that I am going to be the official blogger for Durham Book Festival which runs from the 6th to the 17th of October. 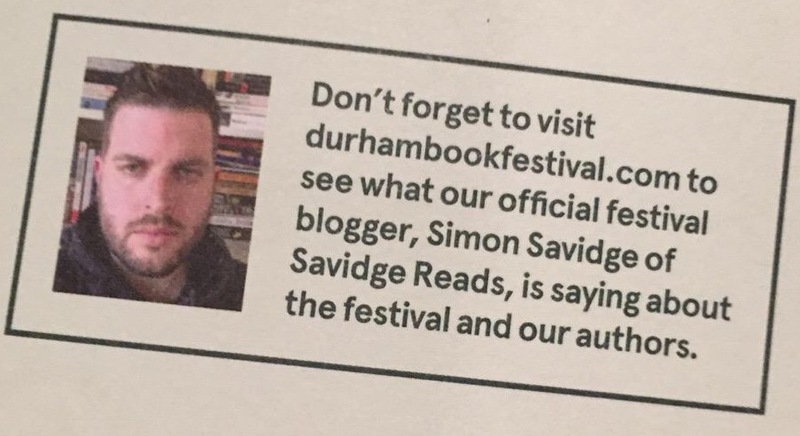 Here basically I will be gadding about and doing a series of ‘live’ blogs here on Savidge Reads and also some posts on the festivals website throughout the eleven days too. 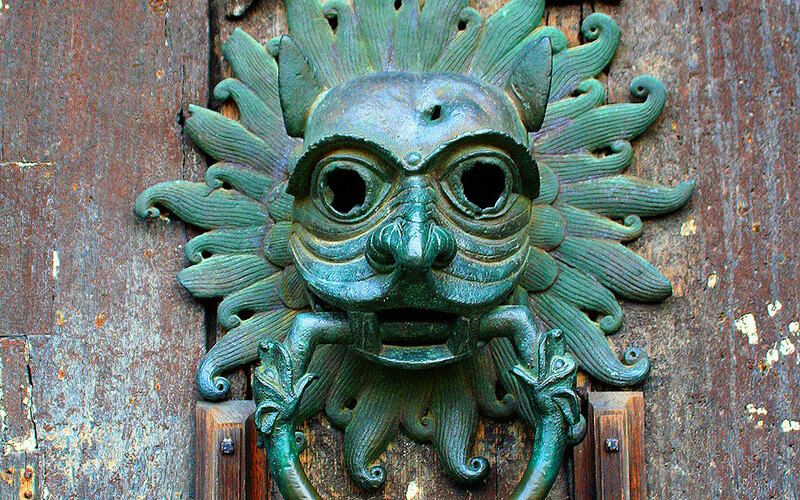 I love Durham and am thrilled to be heading back, as a child I grew up in Newcastle and trips to Durham Cathedral and its impressive knockers (no sniggering at the back) are imprinted on my brain. Looking smiley as always, thank you Tim for finding this in the programme. 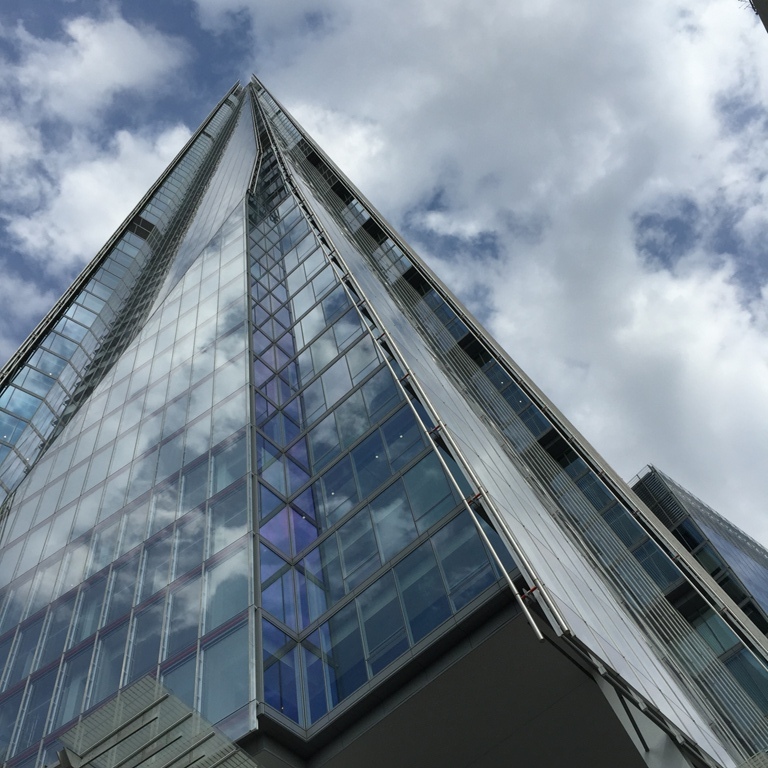 Now as much as I would love to be there for the whole eleven days, I have got a new job (very exciting and more on it next week) and so can’t be there during the week. 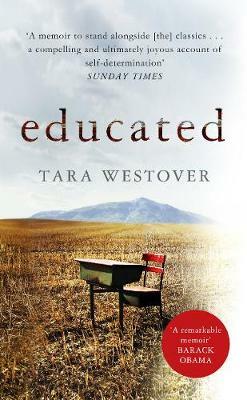 However, I am really, really excited as I am going to be giving some master classes, and offering some advice and mentoring, for some younger writers (who write for The Cuckoo Review) in September who will be ‘reviewers in residence’ while the festival is on. I am so, so excited about this. I bet I will have more questions for them than they will for me. I am also very excited as I will be going to the Gordon Burn Prize winning event, so I am going to be reading all the shortlisted books which I shared with you the other day (which New Writing North are kindly sending me) in advance of the event too. The full programme is here. *It isn’t all books, I have just found out I will be working on LIMF (Liverpool International Music Festival, the biggest free music festival in Europe no less) Summer Jam on the August Bank Holiday weekend, so my life is going completely festival mad, can’t wait! I am a big fan of books live, by which I mean events where you get to hear, see and even meet the authors. Be they literary festivals, events at bookshops, literary salons, recording of radio shows or even a signing (though I find signings a bit impersonal, it’s can all be a bit ‘thanks, now jog on… next’) put me down for them if I can get to them as they always give an interesting (both positive and negative) insight into a writer and their work which I find endlessly fascinating. 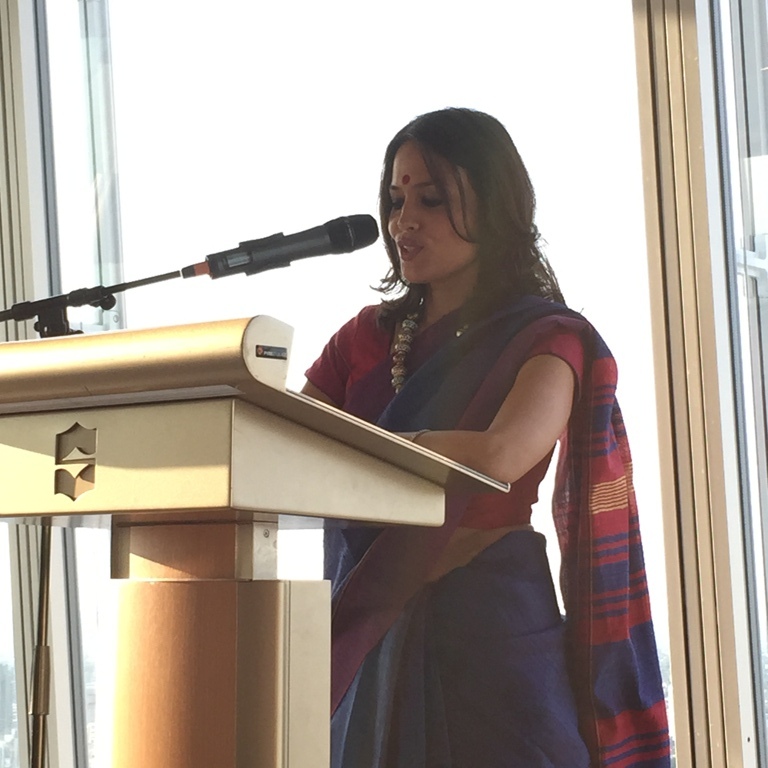 The event was for author and poet, Tishani Doshi who was coming to talk about her work, her life and what makes her the artist and woman she is as well as the links and influences of both the British Isles and Asia have had on her work as a ‘citizen of the world’. Anyway, from the moment Tishani started talking I was spellbound, quite literally – I know that sounds a cliché. 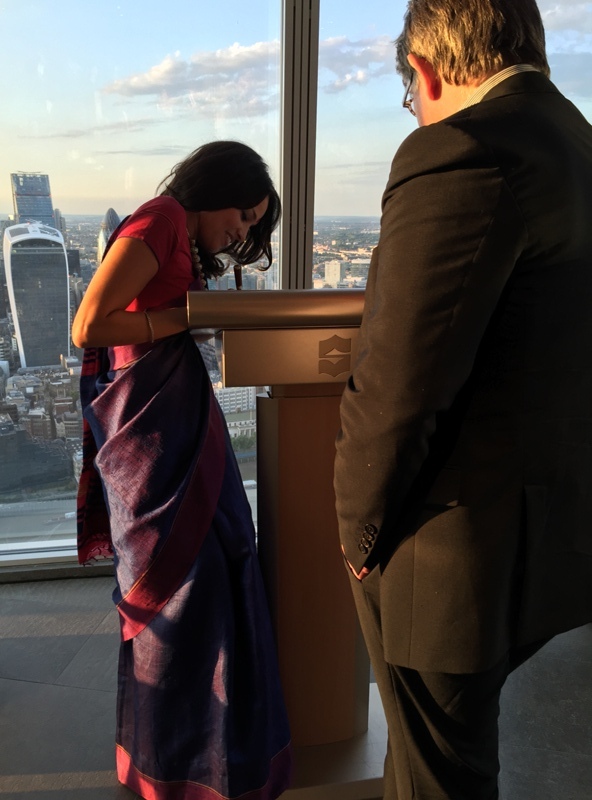 She started by telling us a story, which was actually much more of a myth meeting a fairytale, about her life growing up both in Indian, before heading to Mold in Wales, then India again, then London, then America and back to India. She told us tales of her family which we had to guess if were true or not, she told us tales of The West vs. The East. She read from her poetry collections and from some of her fiction work. As soon as the opportunity came for us to be able to ask questions we all just wanted to hear more from her and her prose. She was incredible. In fact Tishani and her event was everything that I love about ‘books live’. I was completely engaged, I got to learn more about her as a person and as an artist, more about what captures her imagination and how she writes what she writes and she made me think, leaving my mind buzzing with thoughts and things to go and find out more about. I also wanted to go and buy everything she had ever written. Unfortunately for me, but fortunate for my bank balance, they only took cash at the book stall so I only managed to leave with The Pleasure Seekers (which I had signed, that isn’t me in the picture above). I have a feeling I will love and want to then read everything else. Oh the picture above? That is of my bathroom as I got a chance to stay in the Shangri-La afterwards which I will be telling you more about on Thursday, where you may also see a special guest. 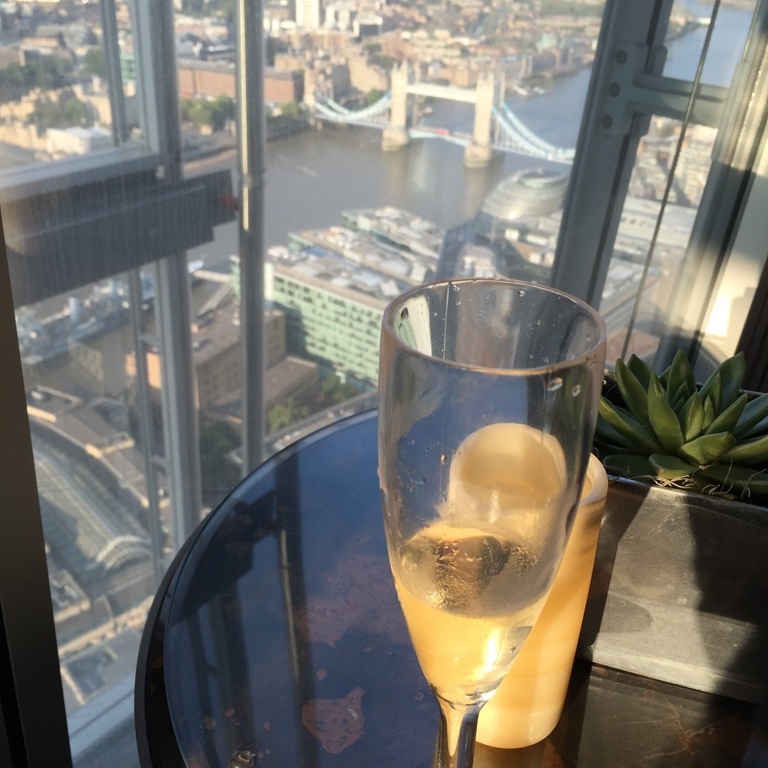 In the meantime though I would love to know of your thoughts on book events, which ones you have been to and loved, as well as some more unusual ones you have been to – especially if they are quite unusual like this one certainly was at 52 stories above the city. Speaking of which, if you would like to keep up to date with the future cultural events going on in the Shangri-La at The Shard then head here www.slculturalsalon.com I am hoping to go for an event in February that was secretly whispered in my ear, it is a corker though so sign up for updates or bookmark that sight if you happen to be in London, I highly recommend it! I would also love to hear from you if you have read any of Tishani’s works too!